(Photo courtesy of Layn Mudder of LPT Images.) Just one week after setting a new track record for the highest car count on a regular night of racing, Dacotah Speedway went and broke that record again. Drivers from all over the Midwest flocked to the 3/8 mile track on Friday, May 29th and when everyone was accounted for, 141 cars checked-in. Fans were in for a special treat as 22 of the Midwest's best WISSOTA Late Model drivers were also in the house. Scott Gartner started on the pole for the WISSOTA Street Stock feature. Gartner lost the lead to outside pole-sitter Chris Michaelsohn on the start but retook the lead before back-to-back cautions on lap two and lap three. Gartner pulled away on the lap three restart while Zach Frederick passed Dustin Frank for third, challenging Michaelsohn for second. A caution on lap five regrouped the field but once again, Gartner pulled away on the restart. It was a four car battle for second between Michaelsohn, Frederick, Frank and Dave Falkenstein. Falkenstein shuffled into the second position while Michaelsohn and Frank raced side by side for fourth. A caution with nine laps to go put Falkenstein and Frederick on Gartner's rear bumper but on the restart, Frederick muscled by Gartner and into the lead. As the laps wound down, Frederick had his hands full with Falkenstein. They raced side by side for many laps as Falkenstein was better in turns one and two while Frederick was better in turns three and four. 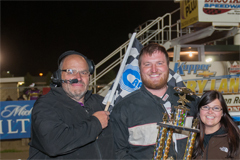 However, Falkenstein could not complete the pass and Frederick hung on to win his first feature of the season at the Dacotah Speedway. Gartner made a last lap pass to retake third place from Chris Michaelsohn while Brock Beeter of Minot finished fifth. Lincoln's Nate Keena took the lead from pole sitter Brian Hanson in the INEX Legends featur e. Hanson fell back through the field quickly, losing positions to Shane Williams, Troy Hoff, Steven Kuntz and Donavin Wiest. Wiest, who started tenth, used the bottom line around the race track to slip by Hoff and Kuntz for third place. When Williams passed Keena for the lead, Wiest followed closely behind. Williams and Wiest battled for the lead while Keena tried to hold off Kuntz for fourth. Wiest, the INEX Legends points leader, powered by Williams to take the lead on lap six. A caution with five laps to go regrouped the field allowing Williams and Kuntz to challenge Wiest for the win. 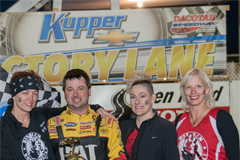 The bottom line prevailed for Wiest who led the final 10 laps to win his second feature of the season. 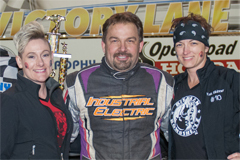 Shane Williams edged Steven Kuntz at the Open Road Honda finish line for second. Tom Wagner finished fourth while Anthony Kopp made a last lap pass to finish fifth over Nate Keena. IMCA Modifieds hit the track next with Chase Conway and Jay Tooley on the front row. Conway took the lead at the start as Tooley tried to hold off a fast Jerad Thelen. Thelen, racing along side the guardrail, took second from Tooley before back-to-back cautions reset the field. On the restart, it was a four car battle for the lead between Conway, Thelen, Mark Dahl and Jeff Taylor. While racing for the lead, Thelen got loose and spun into the guardrail, ending his night early. Dahl led the field to the green flag but Taylor blew by Dahl to take the lead on lap six. Dahl started to fade into the clutches of Jeremy Keller. They briefly battled for second before Keller drove by with 12 laps to go. Dahl continued to fade, allowing Shawn Strand to reel him in. They raced hard for third, flip flopping for position. Racing out of turn four and to the checkered flag, Strand just narrowly edged Dahl for third. Jamestown's Jason Grimes finished a personal best of fifth place at the Dacotah Speedway while Jeff Taylor picked up his first feature win this year over Jeremy Keller. Josh Roehrich and Josh Anderson raced side by side for the lead in the Hobby Stock feature. They raced door to door for several laps before Anderson completed the pass on lap three. Wyatt Rath-Wald took it three wide and into the lead on a lap three restart. Jeremy Engelhardt, who started eleventh quickly marched his way through the field, picking off Brent Vetter, Jaren Wald and Josh Roehrich for position before another caution slowed the pace on lap seven. Engelhardt slipped by Anderson on the restart and challenged Rath-Wald for the win. Engelhardt clearly had the faster car and was all over Rath-Wald's rear bumper as the laps wound down. Coming to the checkered flag, Engelhardt threw his car hard into the corners three and four but got loose and crossed the finish line just inches ahead of third place Brent Vetter. Anderson finished fourth while Nathan Messer rounded out the top five. Wyatt Rath-Wald picked up win number two of the season. *Brent Vetter, who finished third, was disqualified after the conclusion of the Hobby Stock feature for illegal pistons. The 2014 WISSOTA Late Model National Champion, Ricky Weiss, started on the pole for the final feature of the night. Weiss and local favorite, Jeremy Keller, distanced themselves from the field early while Estevan's Aaron Turnbull quickly passed veteran Mike Balcaen for third. By lap nine, the leaders started catching lapped traffic. The slower cars did not phase leader Weiss but helped Turnbull reel in second place Keller. With 12 laps to go, Turnbull passed Keller before caution regrouped the field. On the restart, Turnbull challenged Weiss for the lead. The two drivers battled side by side, slipping and sliding for the lead. The highline prevailed for Turnbull who took the lead with seven laps to go. Turnbull pulled away and went on to win the WISSOTA Late Model feature. After leading most of the race, Ricky Weiss settled for second ahead of Jeremy Keller. 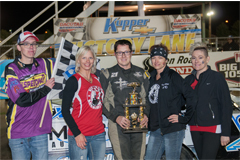 Mike Balcaen finished fourth while Tyson Turnbull, Aaron's brother, finished fifth. The first race in June begins with Dacotah Speedway’s portion of the Dakota Legends Tour on Friday, June 5th sponsored by RDO Equipment. Also that night, IMCA Modifieds and Sport Compacts, WISSOTA Street Stocks and Dacotah Speedway Hobby Stocks. 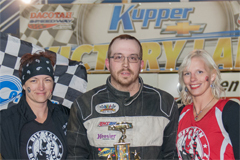 All divisions will be racing for Mandan Dirt Series and National points. 5pm – Pit gate opens. (Legends will pit on the East side of the race track, outside the fence same location as they do for the Governor’s Cup). If you can’t make it to Dacotah Speedway for the race, listen to it live on RACEFEEDX.